Also serving communities of Pittsfield. There are 38 Assisted Living Facilities in the Concord area, with 7 in Concord and 31 nearby. To help you with your search, browse the 117 reviews below for assisted living facilities in Concord. On average, consumers rate assisted living in Concord 3.8 out of 5 stars. Better rated regions include Manchester with an average rating of 4.0 out of 5 stars. Caring.com has helped thousands of families find high-quality senior care. To speak with one of our Family Advisors about assisted living options and costs in Concord, call (855) 863-8283. Concord is the capital of New Hampshire and is home to a little more than 42,000 residents, 15 percent of whom are senior citizens age 65 or older. The city is known for its charming and historic Main Street. There are 38 assisted living facilities in the Concord area. Seven of these facilities are right in Concord, while 31 are in surrounding cities and towns such as Bedford, Manchester and Franklin. 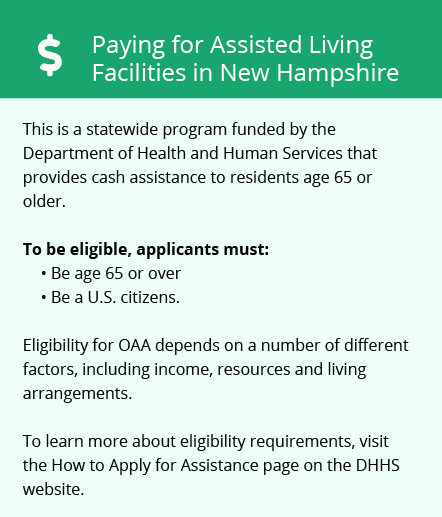 The New Hampshire Department of Health and Human Services, Bureau of Health Facilities Administration licenses and regulates two types of assisted living facilities in New Hampshire: assisted living residence-supported residential health care, which are facilities who may admit residents who require a nursing level of care, and assisted living residence-residential care facilities which provide a lower level of care. Concord Area Transit offers safe public transportation options with specialized services for seniors that include wheelchair accessible origin-to-destination routes and reduced fairs. The Concord area is home to world-class medical facilities, including Concord Hospital, in case of medical emergencies or illness. Concord has an array of community resources for seniors, including the GoodLife Programs & Activities, an organization that provides seniors the opportunity to take part in classes, day trips and other events with their peers, as well as two senior centers. Concord experiences high levels of precipitation year round. The city sees an average annual rainfall of 44 inches, which is 5 inches more than the U.S. average, and an average snowfall of 62 inches, which is 36 inches more snow than the average U.S. city sees each year. Seniors who enjoy spending time outdoors may find the weather in Concord to be inconvenient. The cost of living in Concord is more than 12 percent above the U.S. average. Seniors living in the area will find themselves spending more on health care and personal expenses. Air quality in Concord, and throughout Merrimack County, has seen a great deal of improvement recently. Because of this, it has been given a passing grade by the American Lung Association. Assisted Living costs in Concord start around $0 per month on average, while the nationwide average cost of assisted living is $4,000 per month, according to the latest figures from Genworth’s Cost of Care Survey. 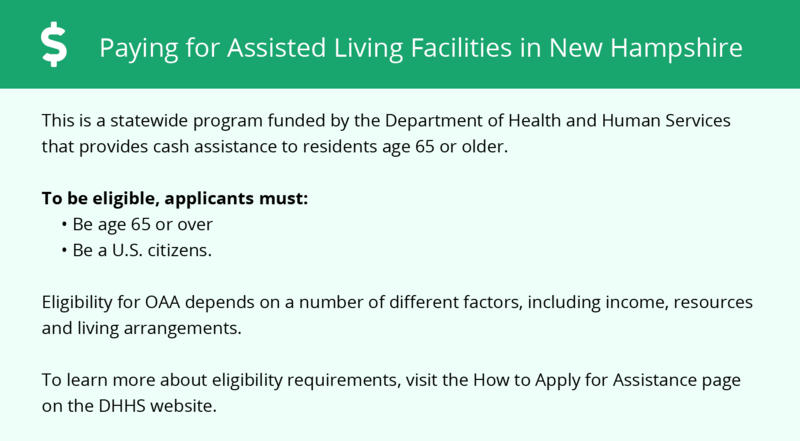 In New Hampshire, eligible seniors can apply for assistance under the Medicaid Choices for Independence 1915(c) waiver, which helps to pay for services provided in assisted living residences. An optional supplement is available to seniors receiving supplemental security income which can be used to help pay for the cost of room and board. To see a list of free assisted living resources in Concord, please visit our Assisted Living in New Hampshire page. Concord-area assisted living communities must adhere to the comprehensive set of state laws and regulations that all assisted living communities in New Hampshire are required to follow. Visit our Assisted Living in New Hampshire page for more information about these laws.